This July, 300 lucky fans will experience the world of Insidious in an interactive installation that will take them into the dark, twisted and disturbing reality of the Lambert Family! With the use of imagery, props, installations, iconic music, exclusive content and more, "TO GO FURTHER" will encapsulate the heartbeat of this unique horror franchise. Located in a haunted loft, the invitation-only event will be held on the evening of Thursday, July 18th, with three special sessions between the hours of 9pm and 1am. Producer Jason Blum (The Purge, Insidious), along with writer/actor Leigh Whannell and Angus Sampson (Specs and Tucker), will be on-site to celebrate with fans as they uncover some of the more insidious manifestations that continue to inhabit this space, all while enjoying delicious food, cocktails and music! 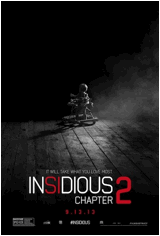 Tickets to the event are being given away exclusively through the Insidious Facebook page and official promotional partners FEARnet, Celebuzz and Cinemablend.